Years ago, I wrote about two PC games that were packaged free with computers running Windows 3.1 and 95. SkiFree was a fun time-waster for a few minutes, and Chip’s Challenge was a surprisingly deep, well-crafted puzzle game. However, there’s a game from the famed Best of Windows Entertainment Pack bundle that I neglected to write about, a game that many consider to be a classic on the level of SkiFree and Chip’s Challenge. A horror game that plumbed the depths of the psyche even more thoroughly than did Silent Hill 2. The beginning of stage 2. 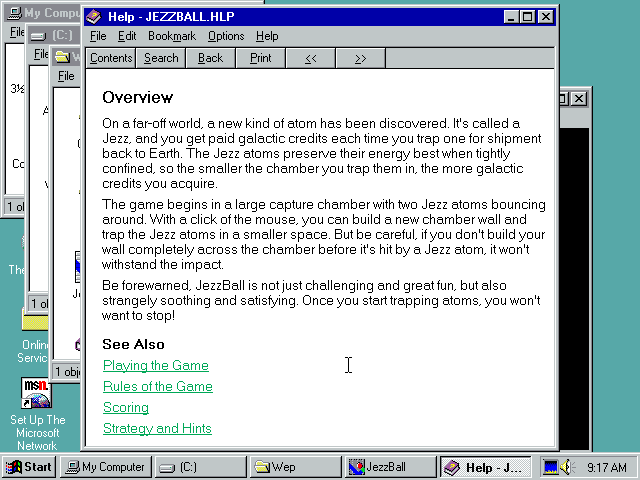 JezzBall is a puzzle game in which the player must trap balls (the help file calls them “Jezz atoms” – yes, Jezz atoms, that’s not a typo) that are bouncing around a chamber while a timer runs. The player can trap these balls by creating walls that reduce the size of said chamber. However, there are a few catches – the wall is broken if a ball hits it before it’s completely built, each wall that’s broken costs the player a life, and the game is over if all the player’s lives are exhausted or if the timer reaches 0. The object of the game is to reduce the chamber’s size by 75%. The player starts with two JezzBalls, or Jezz atoms, or whatever, to trap, and each stage adds another ball to the mix. You thought this was just a simple puzzle game, but check out this deep lore. 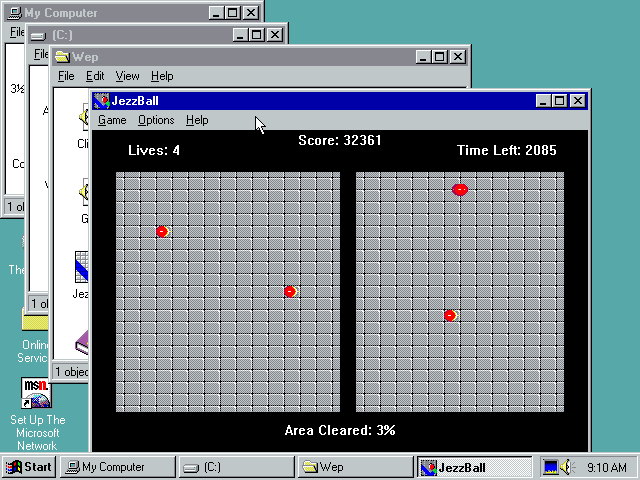 Perhaps you have fond memories of playing JezzBall back in the 90s or one of its clones more recently. Or maybe you played the 80s arcade classic Qix that this game is based upon. But did you ever feel uneasy about it? 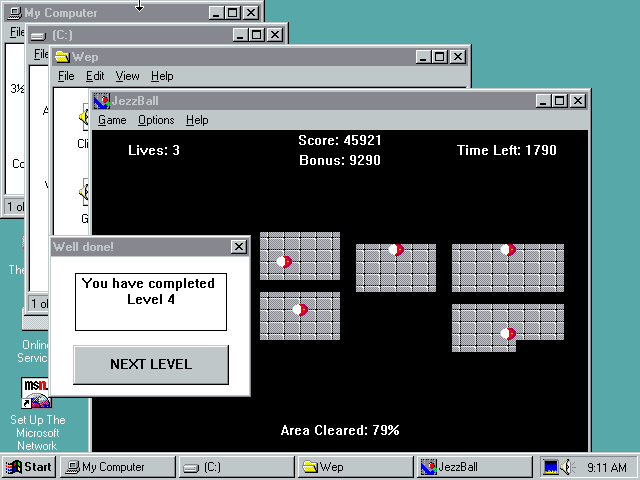 Most people would say that JezzBall is just a little puzzle game, a fun diversion. But for me, it’s more. Playing this game is like looking into the abyss. In the world of JezzBall, your only purpose is to seal atoms into small areas. And after you’ve reduced the space they can move in to 25% of the screen, the game “rewards” you with an additional atom to deal with. Your job becomes more difficult the further you progress, but do your nameless, faceless supervisors care? No. Trap more atoms. Keep trapping atoms. There is nothing else. Soon enough, the pace of your job will become unbearable. You will have a very limited amount of time to trap several atoms without any clear way to separate them into their own chambers. Every time you try to build a wall, it breaks when an atom hits it before it’s complete. You try to build a wall starting in the middle of the chamber to at least create a partial wall, but when atoms hit both ends of your wall you lose two lives and are that much closer to a game over. 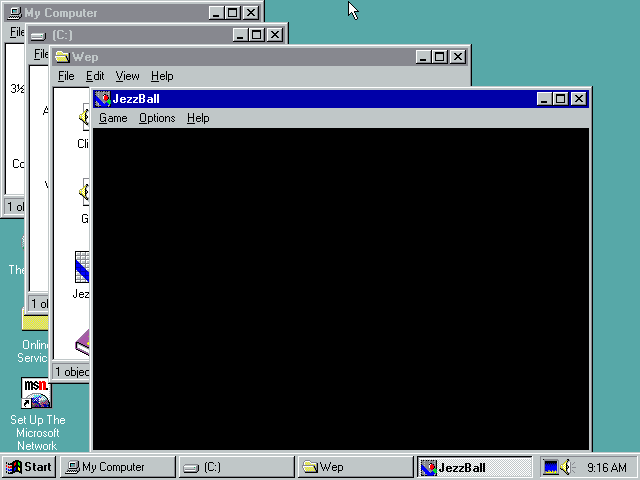 JezzBall doesn’t care. It will continue to throw additional atoms at you until you break. The difficulty curve of this game starts with a gradual slope that leads to a 90 degree cliff face. And when you fall from that cliff, as we all eventually do, you’re given the “honor” of marking your shame by entering your score on the leaderboard. Other games I played growing up had an end goal or a winner. Mario, Sonic, Zelda – the games in these series taught us that perseverance leads to victory. The NES Mega Man games were difficult, but even an average or poor player could beat Dr. Wily given enough time and patience. 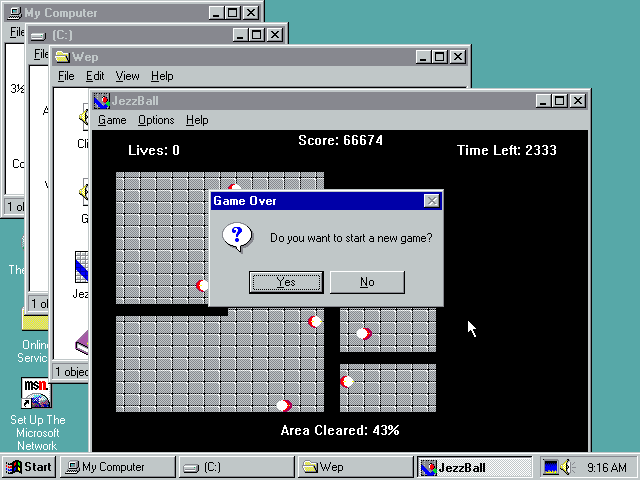 Chip’s Challenge, one of the other BOWEP titles, was a long game, but it also had a final level and an ending to offer. JezzBall mocks your delusions of victory. There is no happy ending in JezzBall, just as there is no happy ending in life. 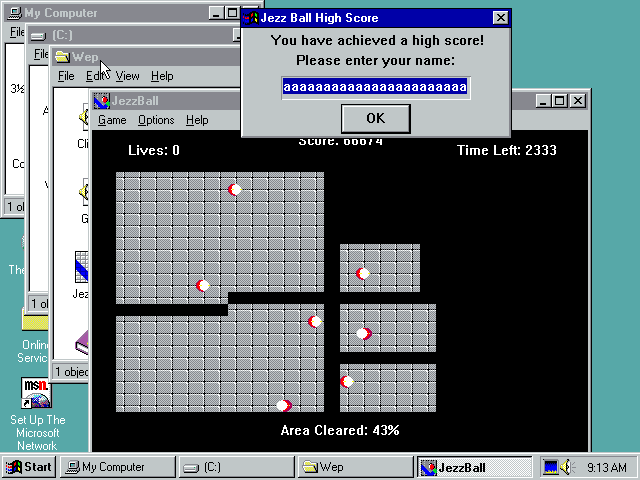 No matter how skillful you are, no matter how far you get, a round of JezzBall always ends in failure. It only offers you the option to play again. And if you refuse to play again, it says nothing else – the game simply leaves you sitting in front of a black screen. Life is a cruel joke. Life is an absurdity. Life is JezzBall. I rate it a 5 out of 7. I actually remember playing this game alongside ones like SkiFree and Chip’s Challenge as you mentioned (in fact, I cleared the latter for the first time a few years ago when it was released on Steam). I seem to remember another one with “Maxwell” in the title, though I can’t quite place my finger on it. Either way, I remember playing this game; I can say if nothing else, it really helps you develop a sense of timing. Yeah, you’re thinking of Maxwell’s Maniac. It looks very similar but uses a different mechanic. That’s a good game too, though from what I remember it wasn’t bundled with so many PCs like JezzBall was. Didn’t take long for me to give that up, did it?